Every morning, the fine folks at Sports Radio Interviews sift through the a.m. drive-time chatter to bring you the best interviews with coaches, players, and personalities across the sports landscape. 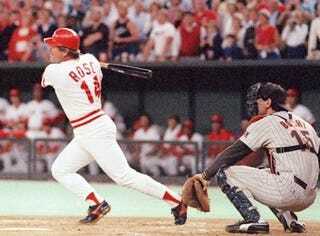 Today: Pete Rose. Former Cincinnati Reds player and manager Pete Rose, after celebrating the 25th anniversary of his record-setting 4,192nd hit, joined Waddle and Silvy on ESPN Chicago to discuss how this past weekend was like heaven for him, what advice he'd give Roger Clemens and if he thinks he's any closer to the Hall of Fame. I'm doing. I survived the weekend. It was like spending the weekend in heaven to me. It was an honor and I appreciate the opportunity to go back down on the field. It was a great response, I've been to ten or eleven games this year here in Cincinnati, never been on the field and got to shake some hands with the players and got to reminisce with the great fans here in this area. Well not Roger, but I'll give this advice to anybody. Don't do like me. You can run but you cant hide. If you made a mistake, get it out there as quickly as you possibly can because it's going eat at you, and it's going to hang over your head as long as you let it hang over your head. And Tom, you don't know what Roger did and I don't know what Roger did. And I'm not here to judge Roger. If Roger says he didn't do it, then who am I to say he's lying? It's not up to me. I met Roger Clemens one time at the all century celebration and he hugged me and he said, ‘I'm happy to be a member of your team, on your team.' That was very nice of him to say that. And I don't know what Barry Bonds did. I don't know what Palmeiro did. I don't know what any of them did. But for anybody listening out there, learn from me. If you do something, take responsibility as quickly as you possibly can and don't let it linger on because it's just going to hurt you. I don't know about that. The commissioners got a tough job. I didn't get up there and cry in front of people because I'm trying to get the ban lifted. I went up there and was very sincere with my ex-teammates and I told them. I said, ‘Guys I just hope that we're friends. I just want to be your friend.' And I got a nice text from Johnny yesterday and I got a nice call from Joe Morgan who couldn't be there because people try to look at things and say, ‘Why wasn't Johnny there? ‘Why wasn't Joe there?' Well ya know, they had other things to do and that's why they weren't there. People can always find negatives, but I did what I felt I had to do. I had to get this off my chest. And sure I could have called Griffey individually, or I could have called Cesar individually, or I could have called Tony Perez individually which I did. But there again, I knew they were all going to be together and it was a great opportunity for me to express my feelings and to apologize to them because we've been through wars together with these guys. Everybody had a delightful time and evidently from what I hear I wasn't the only guy in the audience who cried."